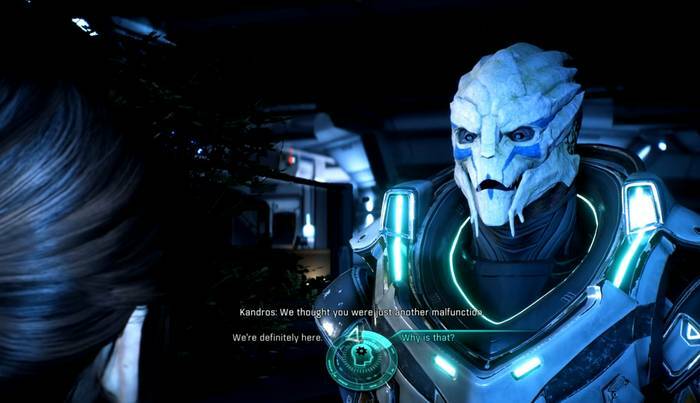 This page contains a full walkthrough for the Main Mission Nexus Reunion, including objectives, dialogue options, enemies and strategy. 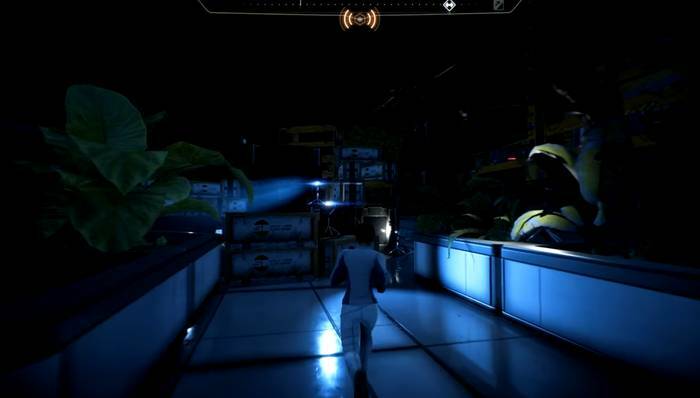 After the incident at Golden Planet, Ryder awakes on board the Ark Hyperion. 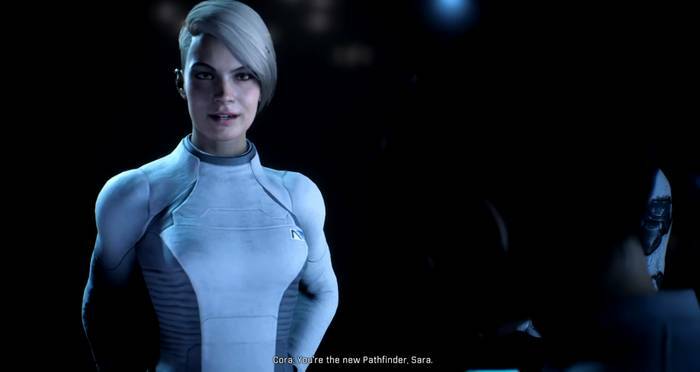 She has an obscure memory of what happened in the last mission and seeks answers from the rest of the Pathfinder team. 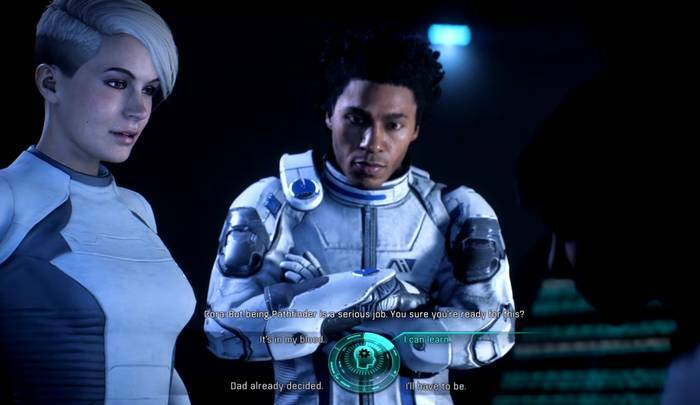 As Ryder approaches the Pathfinder team, she asks questions leading up to the whereabouts and fate of her father Alec. 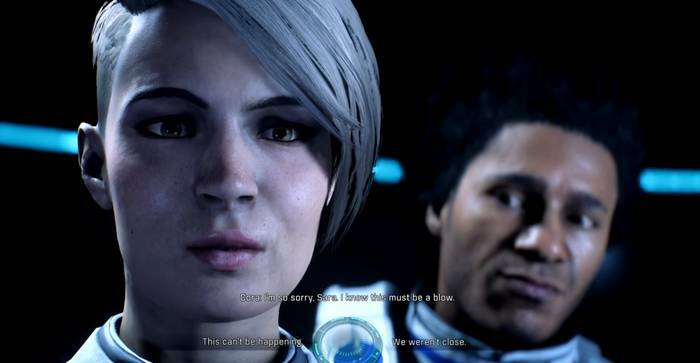 Cora breaks the news to Ryder, to which Ryder can respond. Text This can’t be happening. We weren’t close. Deeper into the conversation, it would seem that Alec transferred his Pathfinder authority to you, to which you an respond to in two ways. Text If there’s no other choice.. Are you kidding me? Cora will then ask you to affirm you’re decision. You’ll have to live up to what it takes to be a Pathfinder, which you can answer in four ways. Text It’s in my blood. I can learn. Dad already decided. I’ll have to be. When the rest of the crew leave, you’ll have a short conversation with SAM. He’ll tell you about the private channel that your father and him used to share. You’ll have to respond in one of two ways. SAM: “This is our private channel. I shared it with him. Text Why’d he pick me? What channel? After the events at Hyperion, you’ll be taken to a cutscene happening elsewhere concerning what transpired on the Golden Planet. The scene will return to Hyperion again. 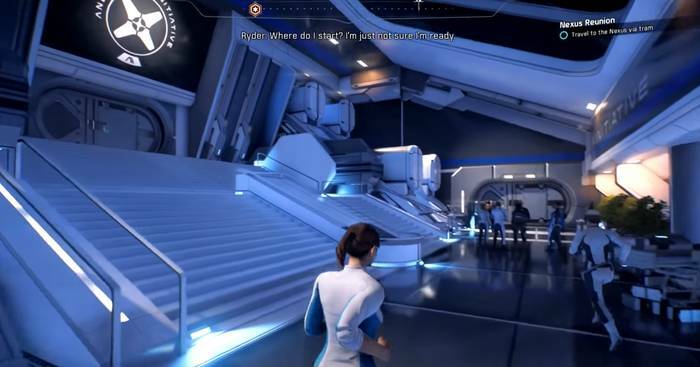 After the short cutscene, you’ll gain control of Ryder. 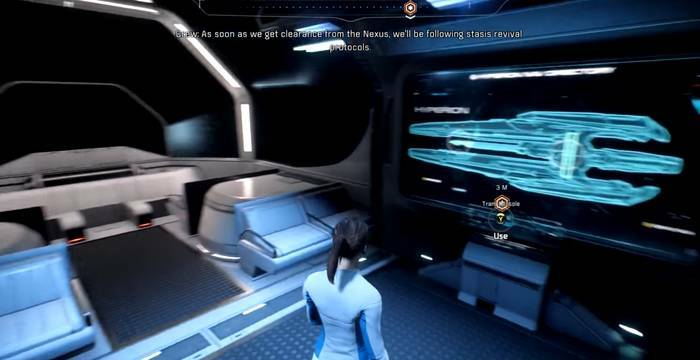 Follow the marker towards the Nexus by proceeding deeper into the ship’s main sectors. You can have a look around and talk to the staff, as well as acquainting yourself with the various sectors of the Hyperion. When you get to the tram, interact with the terminal console to travel to the Nexus. You can try to listen to Cora and Liam for some pieces of information on your trip. Once you arrive at the Nexus, approach Avina who’s just a little ways ahead standing in the room. She’ll brief you of the immigration process. You can choose to find out any of the following information below by choosing them from the dialogue screen with Avina. Alvina will then tell you how the Nexus aims to provide a safe, stable, and prosperous environment to visitors there. You’ll also notice Cora comment on the various information that Alvina shares, though with much reservations. After talking to Avina, head the down the short set of steps to Alvina’s right and proceed forward to the dimly lit section ahead. Then, make a left on the corner of a counter. You’ll find a Construction Worker there that you need to talk to so approach him to interact with him. 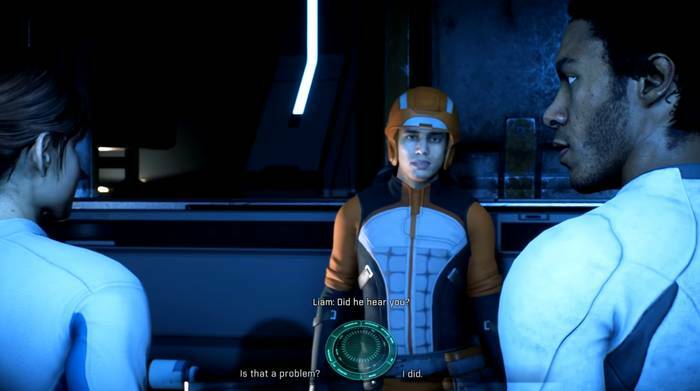 Ryder will greet him, though he may seem that he didn’t really hear or understand you (as Liam will comment). 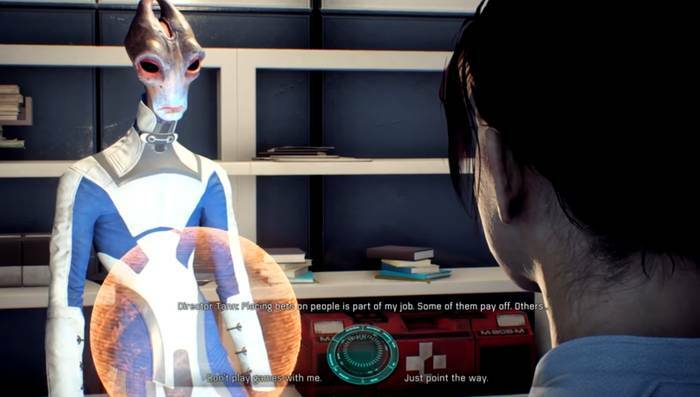 The worker will ask you something, to which you can respond with the dialogue options below. Worker: Did you say an ‘ark’? Text Is that a problem? I did. After a few more exchanges, you’ll meet Tiran Kandros. Hear out the ensuing conversation that leads to the issue regarding the malfunction sensors. 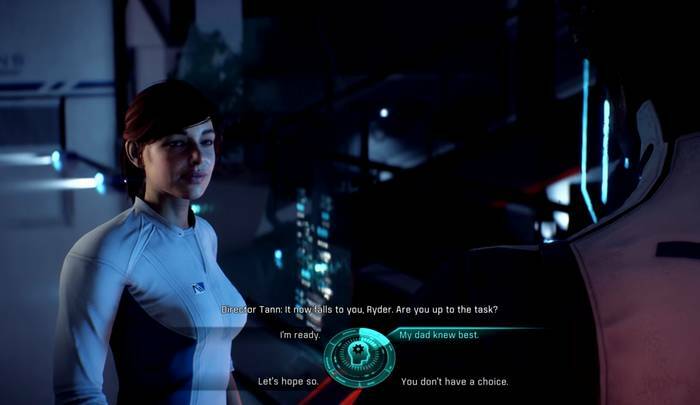 You’ll have to choose from the dialogue options again on how to respond. Tann: “I’m Jarun Tann, Director of the Iniative. You have no idea how much your arrival means to us. Text It means more to us. We’re here to assist. Outcome TBA Addison: We could use any supplies you have – food, water – we’re short on everything. Further into more conversation, Tann will ask you if you’re really up to the task of Pathfinder. You can respond in a variety of ways. Text I’m ready. My dad new best. Let’s hope so. I don’t have a choice. Once Addison leaves, you’ll talk with Kesh a little bit more. He’ll give you a more formal welcome to the Nexus. 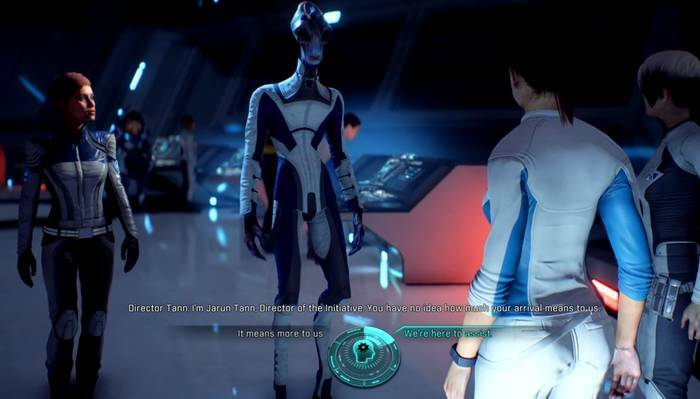 You can respond with the dialogue options from here again. Text Thanks for helping. It’s a mess. A few more points in the conversation with Kesh and she will take her leave. 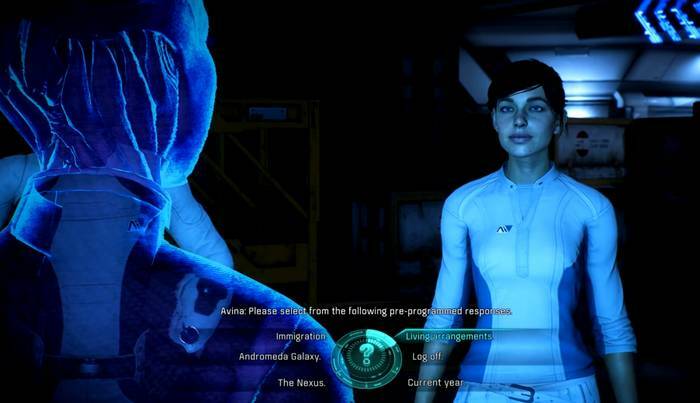 When you gain control of Ryder again, you can take the time to get to know the Nexus from the Optional Objectives there. Otherwise, speak to Director Tann by following the marker to his location. You’ll be then get to know more about the situation from Director Tann. Deeper into the conversation, he will comment on how he is willing to put his trust on people. 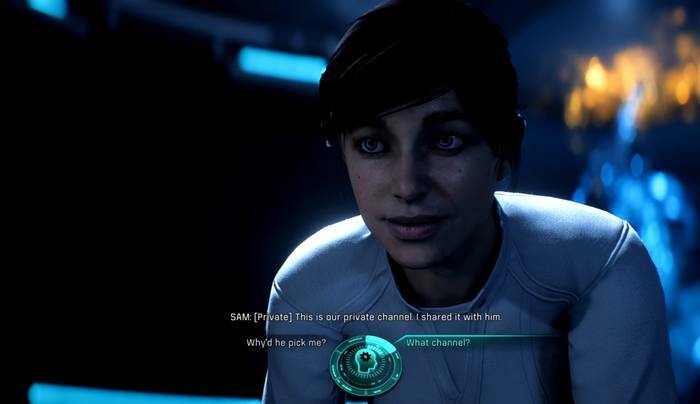 You can respond with the dialogue options shown below. Text Don’t play games with me. Just point the way. 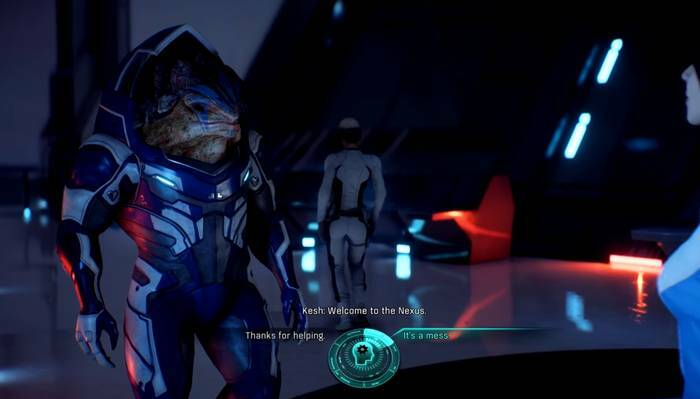 This concludes the Main Mission Nexus Reunion for Mass Effect Andromeda.